Even though we chose not to do any decorating ourselves, I still really enjoy and appreciate when other people put forth the effort to do so. And just because I didn't spend the time to festively decorate our home for the holidays doesn't mean that I'm a scrooge. In fact, I love Christmas! I fondly remember riding around as a kid through the neighborhoods that went all-out with the decorative holiday light displays. There was a street where all the houses donned lights, it was my favorite because no dwelling was left undecorated. As a kid, seeing those lights were magical. I'd be lying if I said that it still didn't give me the same giddy feeling now that it did back then. It's the one holiday tradition - if you can call it that – that has stuck with me throughout the years. It's sort of a guilty pleasure of mine because, as an adult, I know that it's an impractical use of power and that it's a waste of electricity (depending on who you ask). 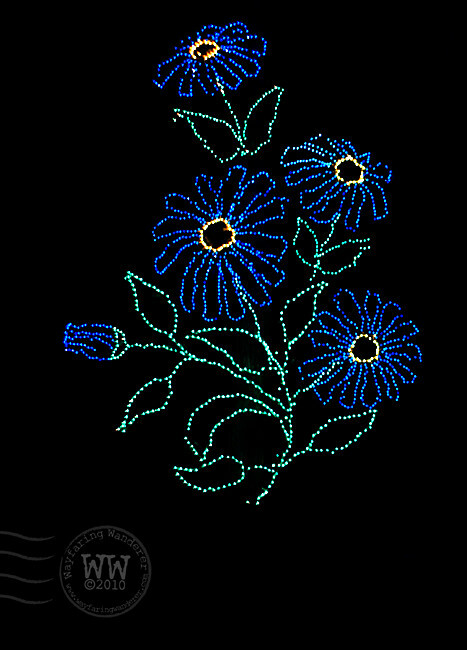 But I can't help it; I blame the fact that I'm such a sucker for sparklies on my childhood. There isn't one place that I return to annually for my Christmas light show fix because it loosely depends on where we are and when we'll have time. 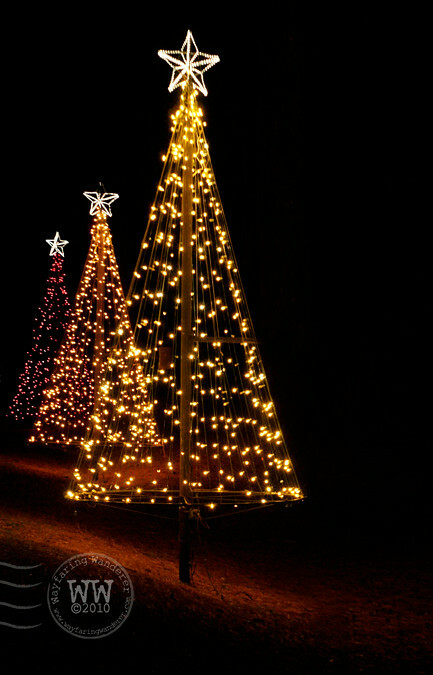 A couple of weekends ago we attempted to make plans with some of our friends to visit McAdenville (Christmastown USA) to tour their illuminated town. However, the weather conditions prevented us from actually doing so, which was a bummer - maybe next year. We arrived in the evening with a little extra time to relax in our comfy room before heading over to see Callaway Gardens covered in lights. It was a good thing that we waited to go later, too, because the bumper-to-bumper traffic we saw clogging up the entrance earlier was gone by the time we got there. Parking, on the other hand, was an utter disaster but we found an open spot despite the confusion from parking attendants. 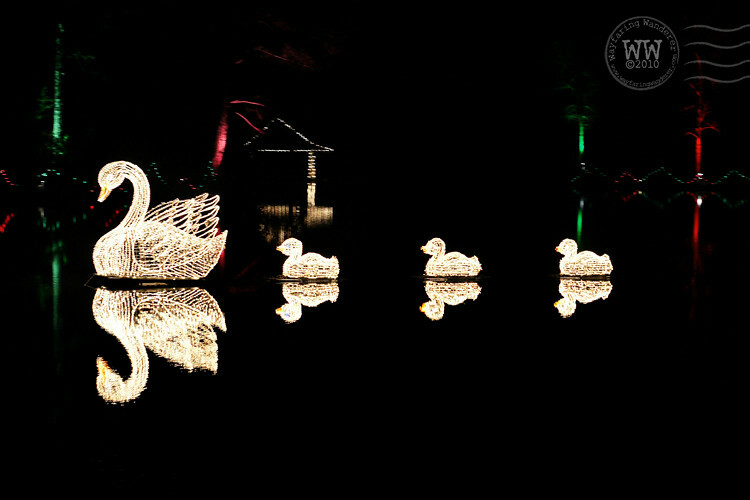 There were a couple of ways that you could work your way through the 5 mile long light and sound show. You could drive your own vehicle, which would be nowhere near as fun if you're the driver, or you could hitch a ride on one of the open-air trolleys with the other guests. Despite the cold temperature, the latter was a lot more appealing to me because I didn't want to get stuck driving. I planned on rubbernecking and I didn't want to be responsible for a collision! Needless to say, hopping on the trolley was a wise decision. 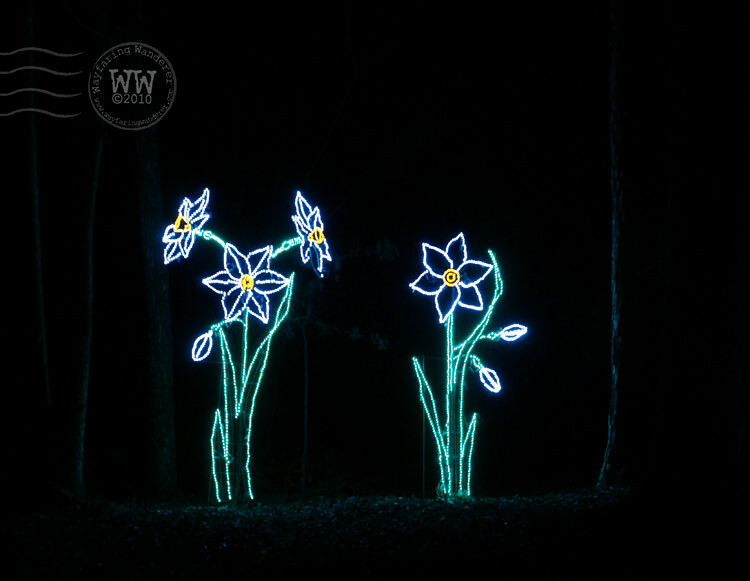 Fantasy in Lights debuted in 1992, and in its 18th year it still continues to mesmerize thousands of children (and adults) with more than 8 million twinkling lights illuminating Callaway Gardens' wooded landscape. An already idyllic setting is transformed into a holiday light and sound show extravaganza by nightfall for a visual experience that will infuse you with an extra dose of holiday spirit. There were times, though, when the amazement could be heard over the music in the form of oohs and ahhs. 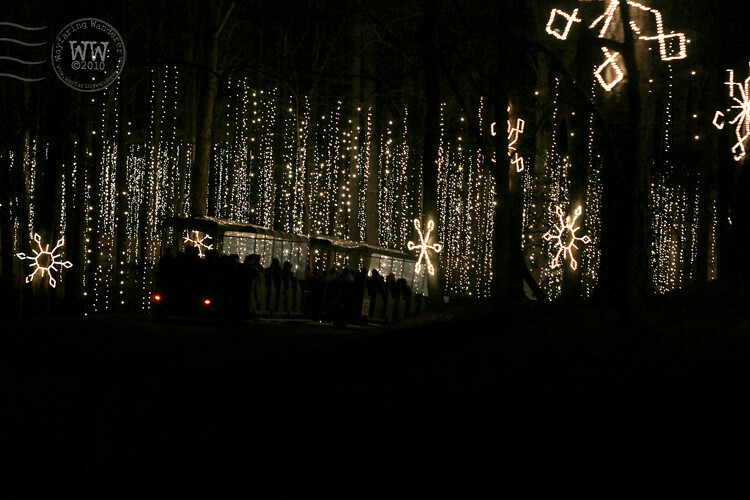 The most spectacular displays were just simple tunnels of lights with sparkling strings hanging above head, like Snowflake Valley and the Enchanted Rainbow Forest. I feel slightly fruity admitting that those were my favorites, but they were magnificent. However, not all the displays were the most well-designed or exciting. Some of them were kind of lame, actually, but they were still entertaining. If anything, it was a fun way to spend time with the people you love during the holidays that is out of the ordinary. 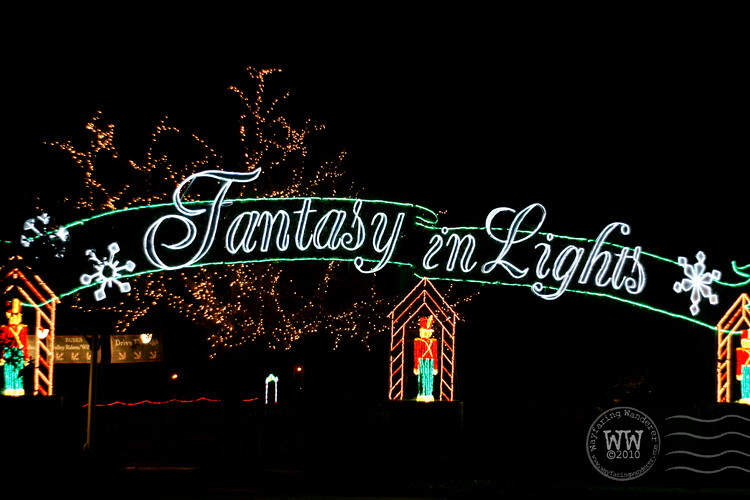 I'm really hoping that there is still time to experience another Fantasy in Lights display of some sort before the holidays are behind us. 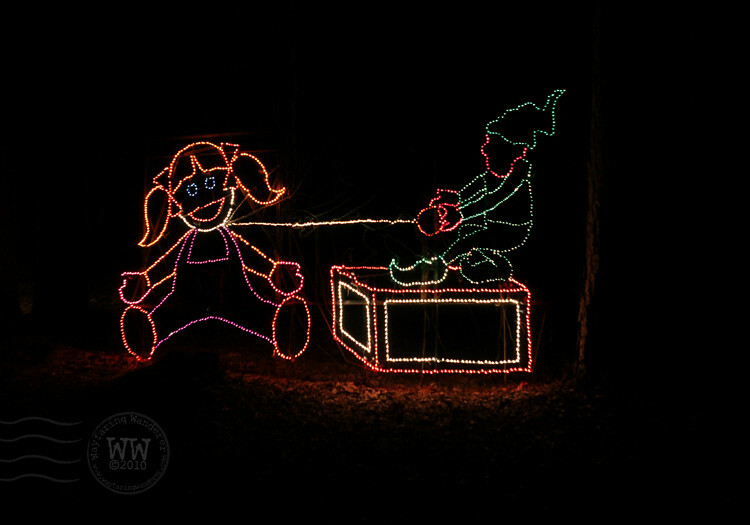 With all the festive light shows around us in NC, we shouldn't have any trouble accomplishing that. But there isn't much time left, though, so I better get on the ball! 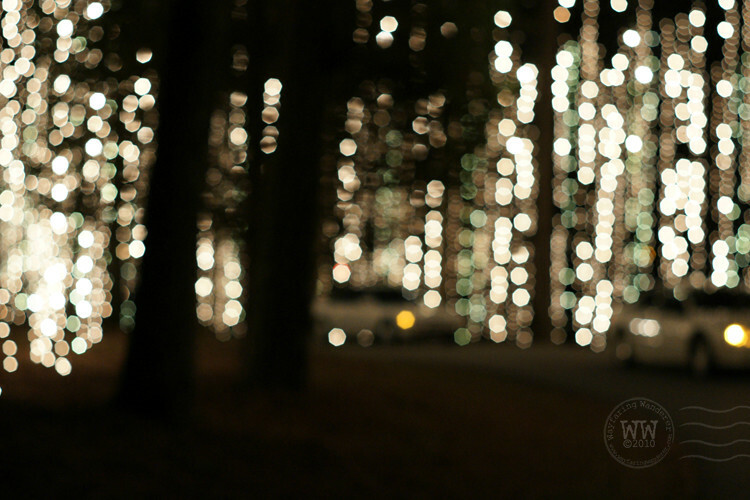 What tradition will your family be continuing during the holiday season? Beautiful photos, you've brought a little holiday cheer to me down in Santiago where the closest thing to Christmas decorations as I know them are lights on a palm tree. That Santa does look a little creepy. I guess it would be hard to look jolly in that situation. <3 Love the first pic. So magical.